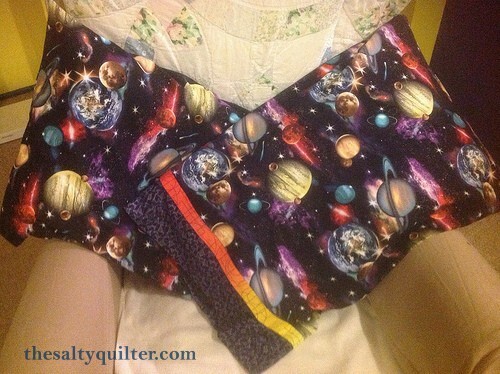 Pillow cases for my cousin’s son to go with his (to be made) solar system quilt. 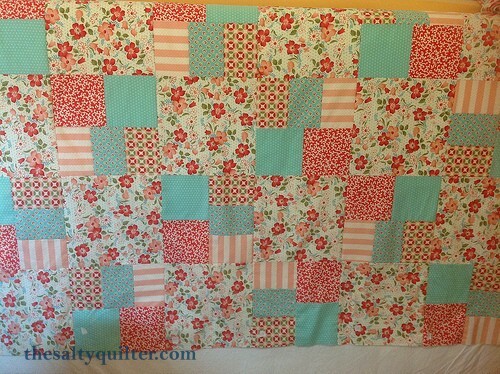 Made with “The Quilter” magazine pillow case pattern, modified to be slightly smaller and with a French seam. 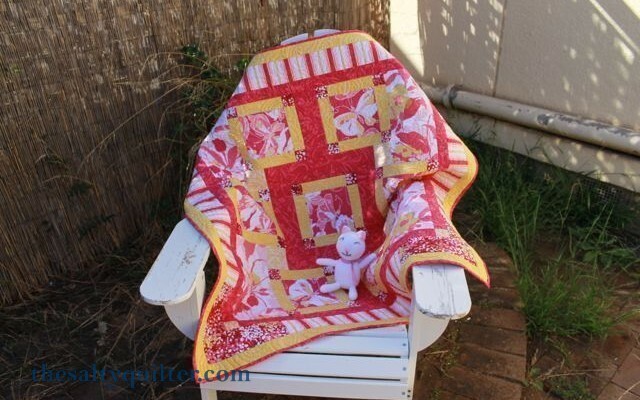 The fabric is by Elizabeth Studios. I got it at Spotlight (Australia’s version of Joann’s). 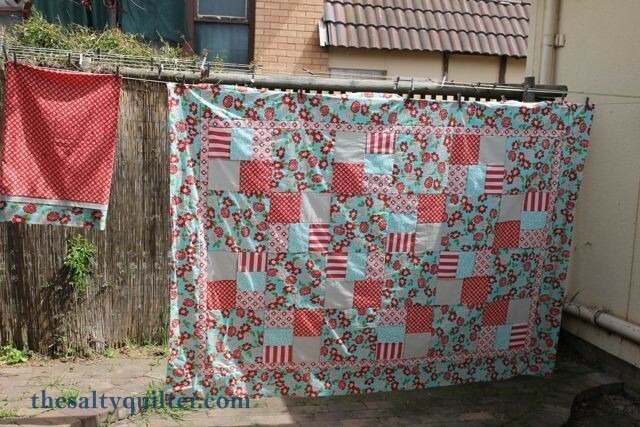 I was really impressed by how bright the fabric is, even after washing. I designed and made this for the Hobbysew Belconnen “Autumn in our Town” challenge. 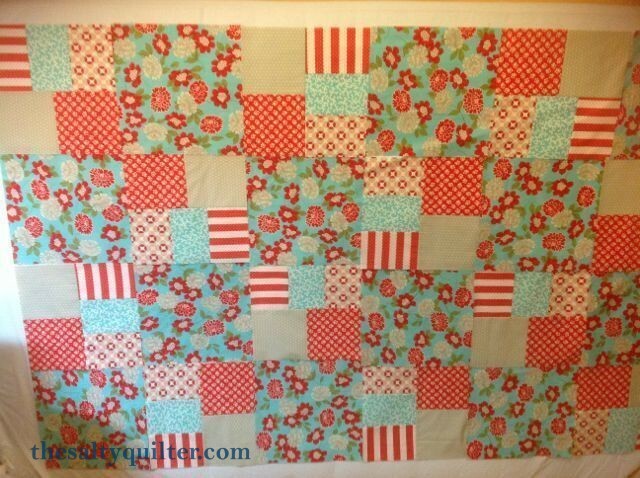 All the fabrics except the light blue background were in the fabric challenge pack. 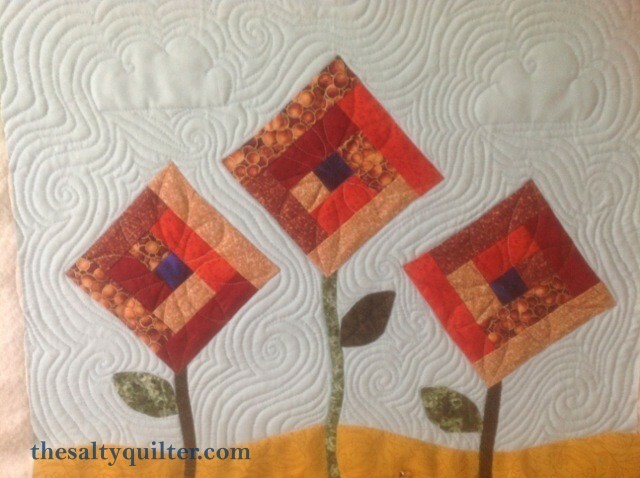 I had seen a pieced quilt that used on point log cabins as flowers, so I used a similar idea, but with applique. 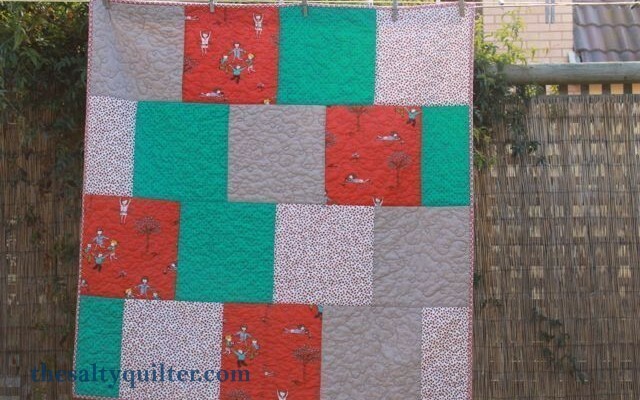 I used a small zig zag with invisible thread to attach the log cabin blocks and leaves. 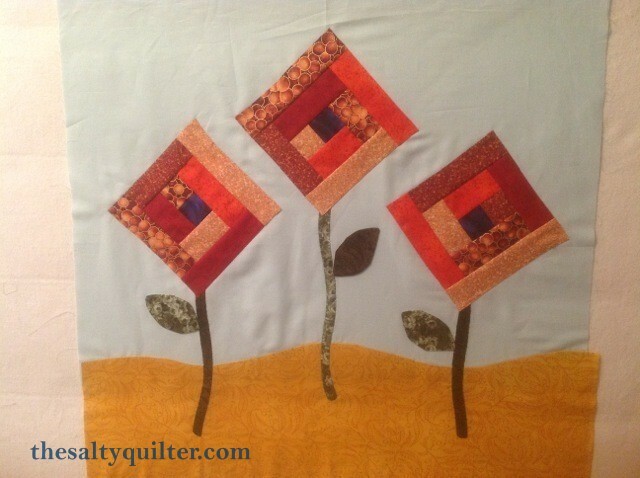 I used fusible web and blanket stitch applique for the ground and stems. 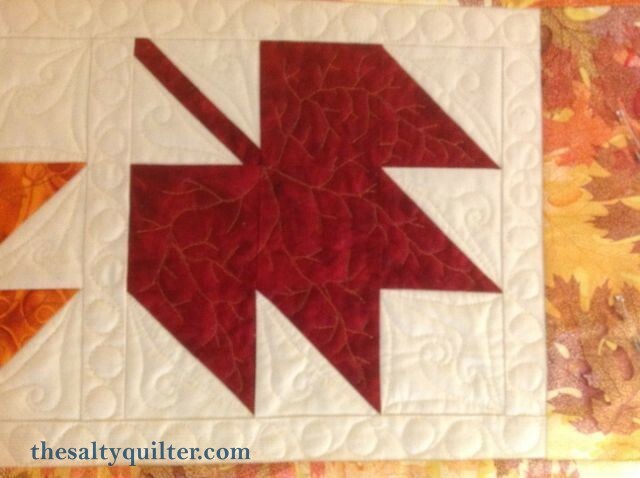 After taking Helen Godden’s intermediate free motion quilting class, I wanted to push myself with the quality and design of the FMQ. The sky is based on Leah Day’s ocean currents design, and the ground is based on Helen’s baptist fan design. I put clouds in the negative space as another design element. 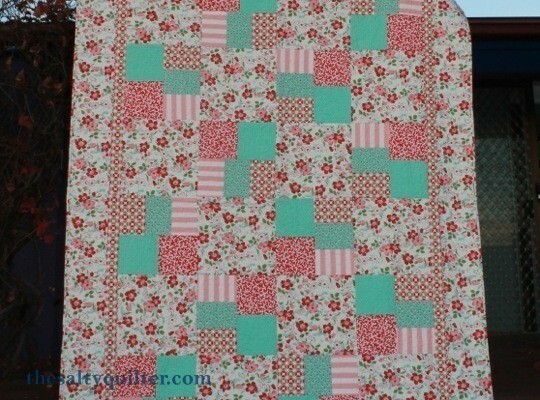 One issue I had was I pieced batting together using a zig zag stitch, which was visible through the top. 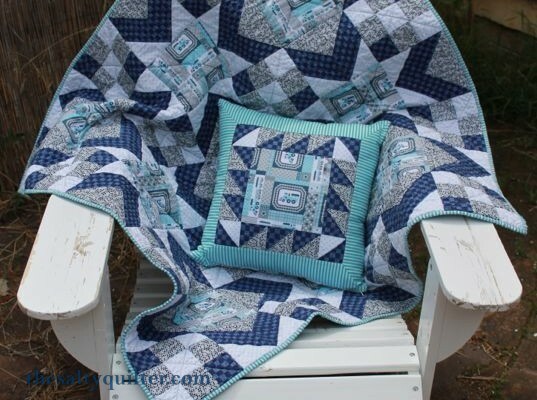 Next time need to try a herringbone stitch as suggested by Harriet Hargrave. Approx 45″ x 45″ when completed. 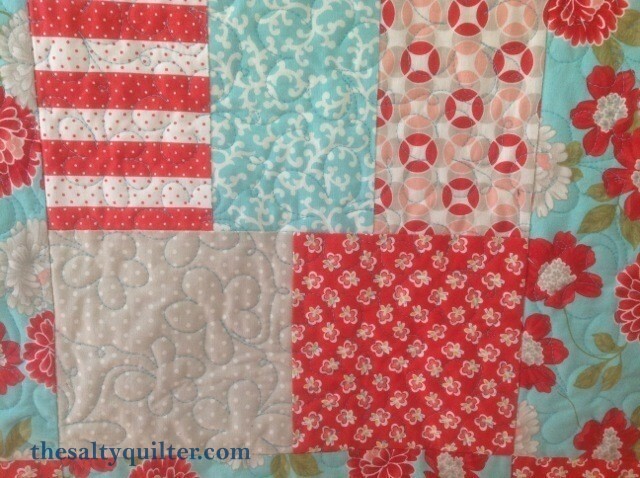 Mystery quilt designed by Fran Williams. 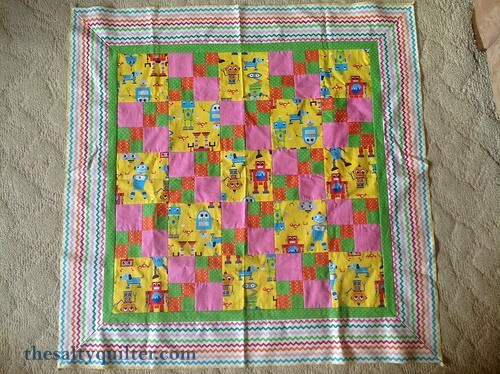 Gift for friends’ baby boy. 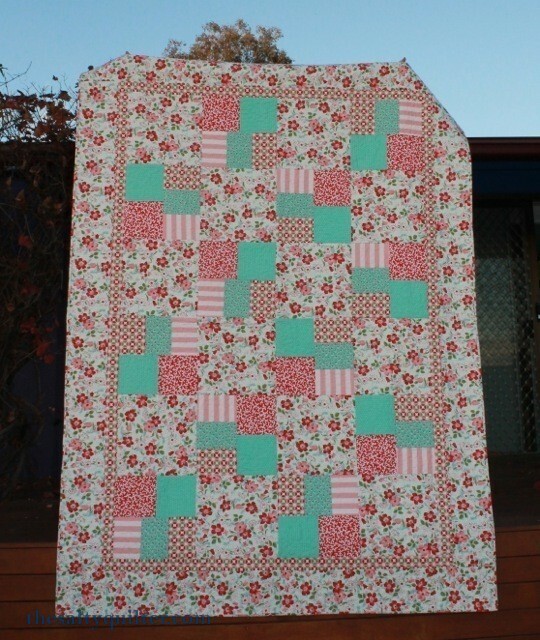 Class taught by Jenny Bowker, 12 Jan 13 at Addicted 2 Fabric in Canberra. Great design with 1 focus fabric, 1 light, 1 medium, 1 dark. I also used navy plaid flannel shirting for the back. Made half square triangles from the chevron off cuts. 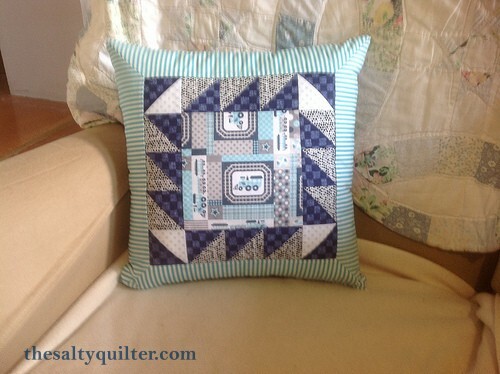 Used some to make a matching pillow. My first time installing a zipper. Used super helpful tutorial to guide me. 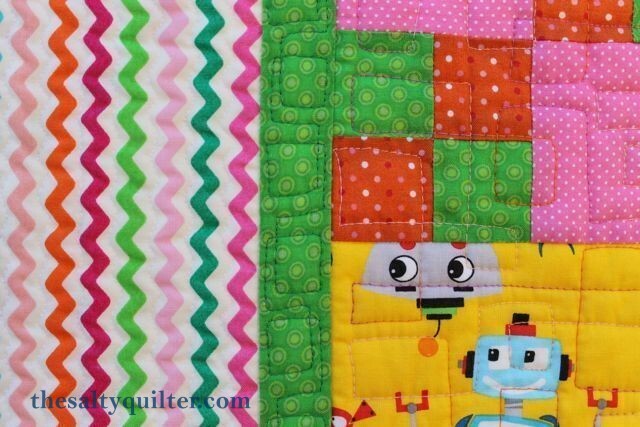 Quilted in the ditch and diagonally through nine patch blocks. 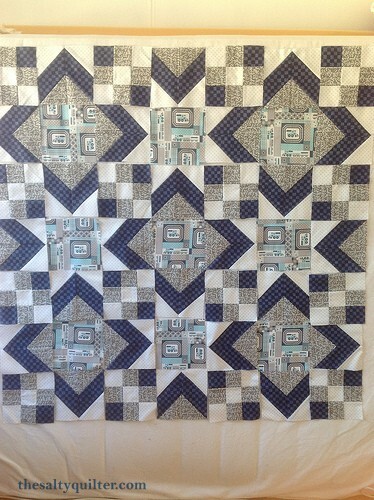 Did FMQ piano keys in dark section of chevron block using Signature 40wt cotton in dark royal blue. Had some issues with the binding being particularly wrinkly. 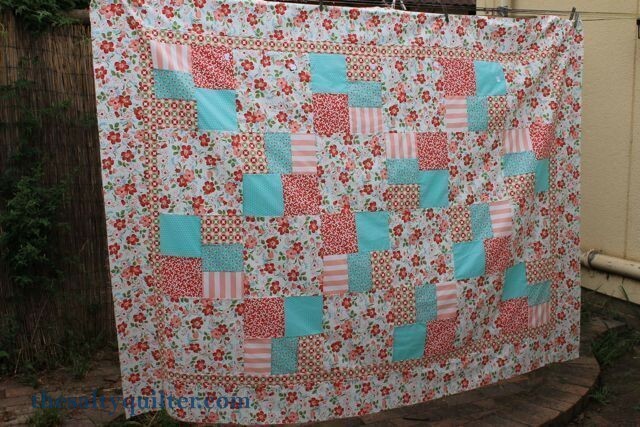 May be the fabric (didn’t pre-wash any in the quilt). 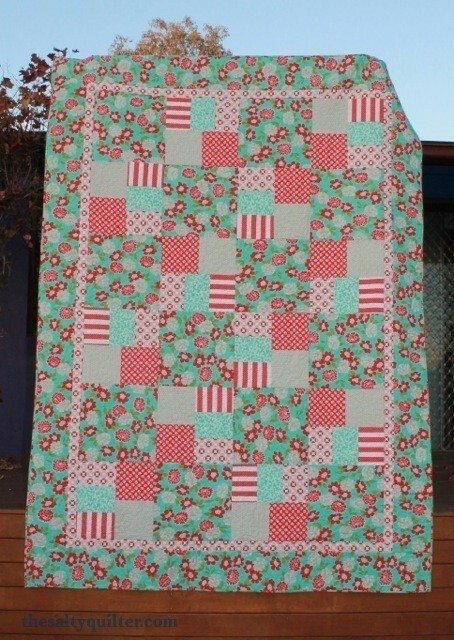 From a $30 (on sale) kit from the Crafters Mall in Redding, CA. Pattern is not the best. Very brief and no layout diagram, which was frustrating. Fabric was all labelled though, which was very handy. 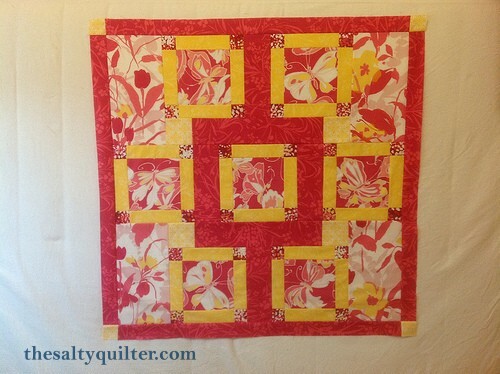 I decided to leave off the last two borders and use the dark pink for the binding. Made a crocheted amigurumi kitty for big sister. 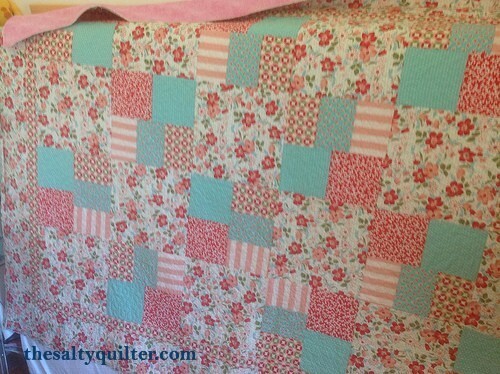 Quilted with Signature 40wt cotton in Cotton Candy. Used free motion swirl design by Ivory Spring. 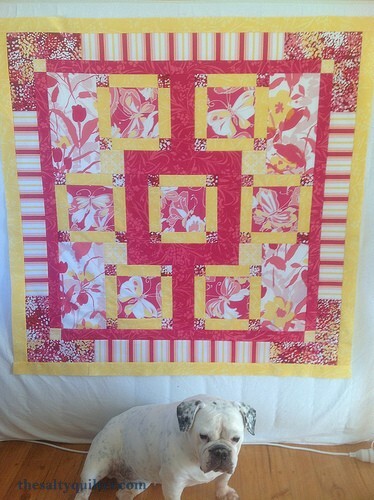 Sarah the Bulldog approves of this quilt top. 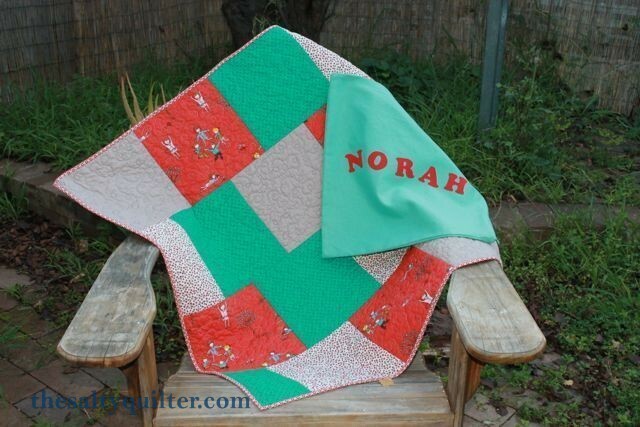 A baby gift for our friends who are both in IT. 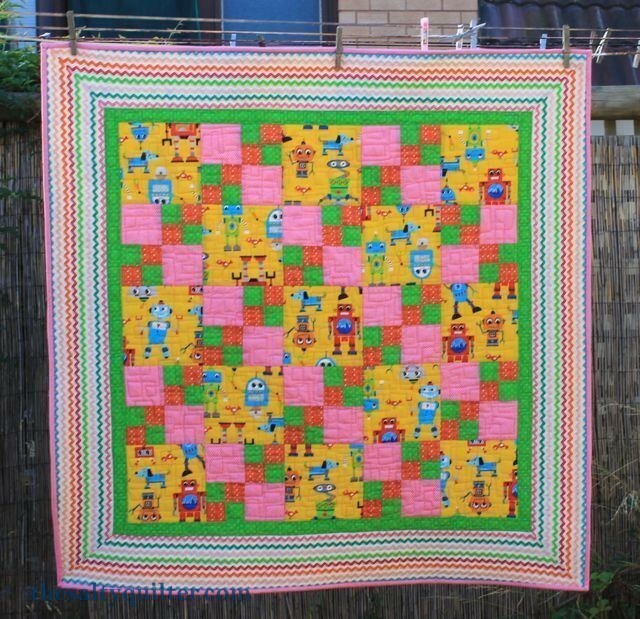 A baby gift for our friends who are both in IT. 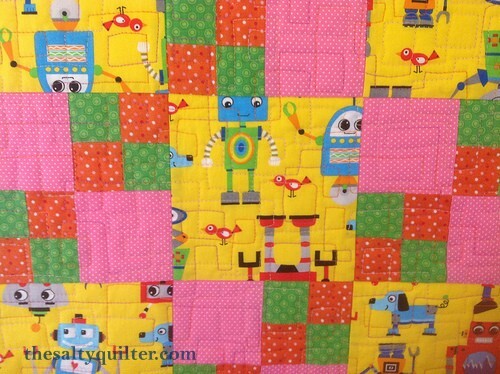 I had a hard time finding gender neutral (let alone girlie) robot print, but I think this colour combo works well. 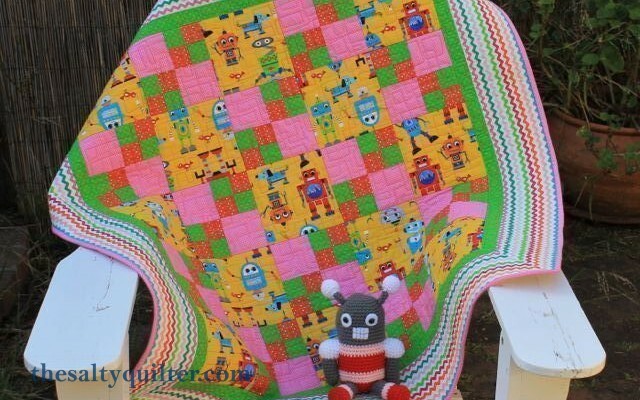 I also made a crocheted robot amigurumi from the book Amigurumi Two by Ana Paula Rimoli. 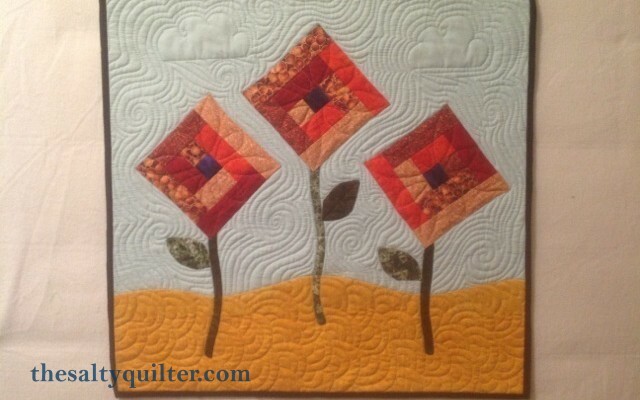 The middle is quilted in my version of Geometric Allover by Angela Walters. 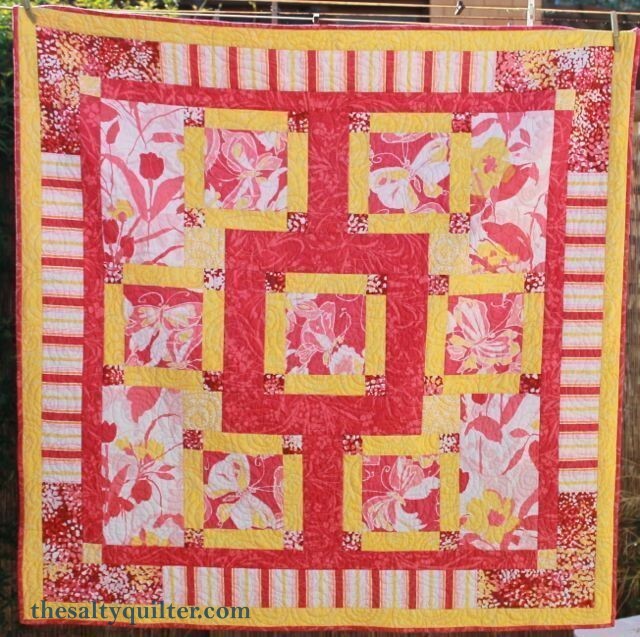 Quilted with Superior variegated pink 40wt in center, and Gutterman 50wt cotton in borders. 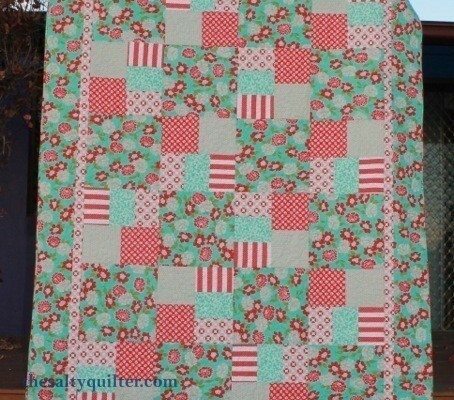 The final season wall hanging for Grandma Mary Jean. 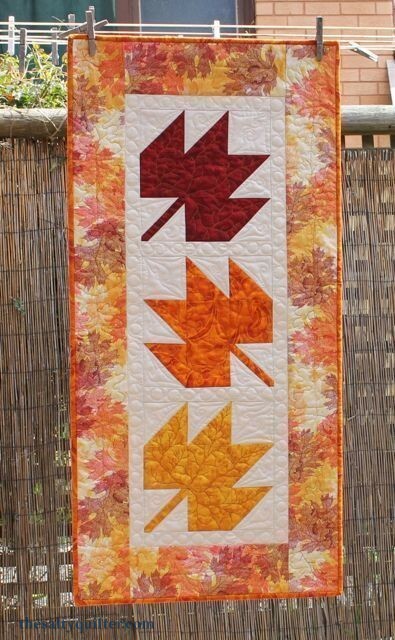 Leaf block based on traditional design and 9″ finished. 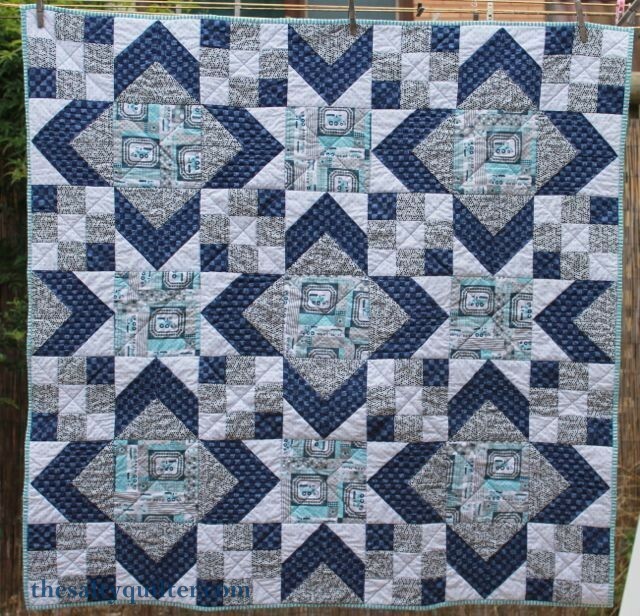 I used the Missouri Quilt Company’s technique for half square triangles by sewing around two squares and used the formula covered here. 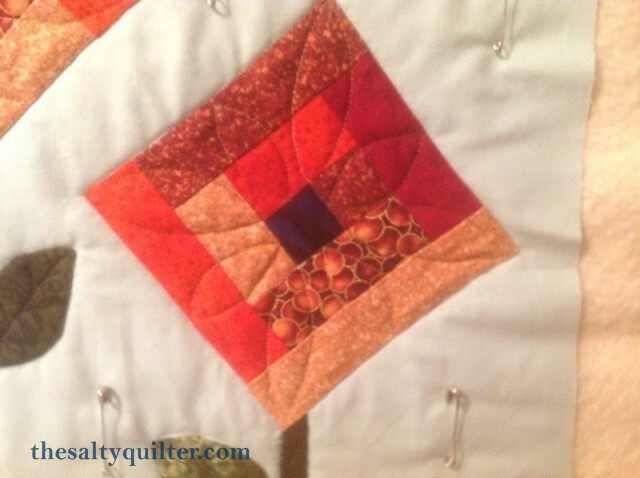 I calculated 5.5″ squares for 3.5″ HST’s, but rounded up to 6″ so I could trim them down to size exactly. 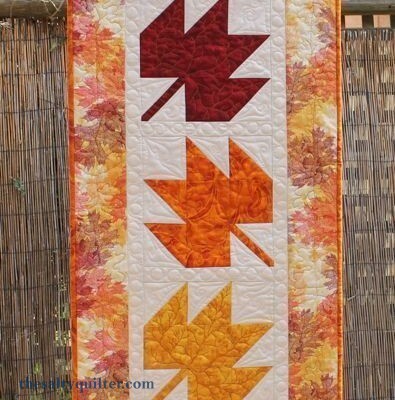 I used Mettler Polysheen for the leaf vein free motion quilting, and Gutterman 50wt cotton for the other FMQ. For my Star Wars crazy co-worker’s twins. 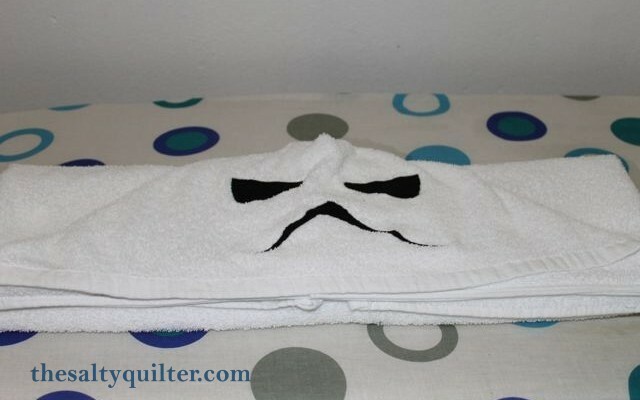 I made hooded towels and added a stormtrooper applique face. The stormtrooper face was printed at 115%. I used white Gutterman SewAll polyester thread and satin stitch. The towels are oversized for the baby, but will grow into it. 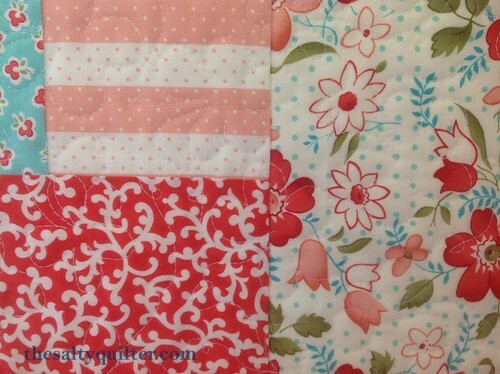 Sew Easy 100% cotton batting. My own basic design. Terri choose colours. 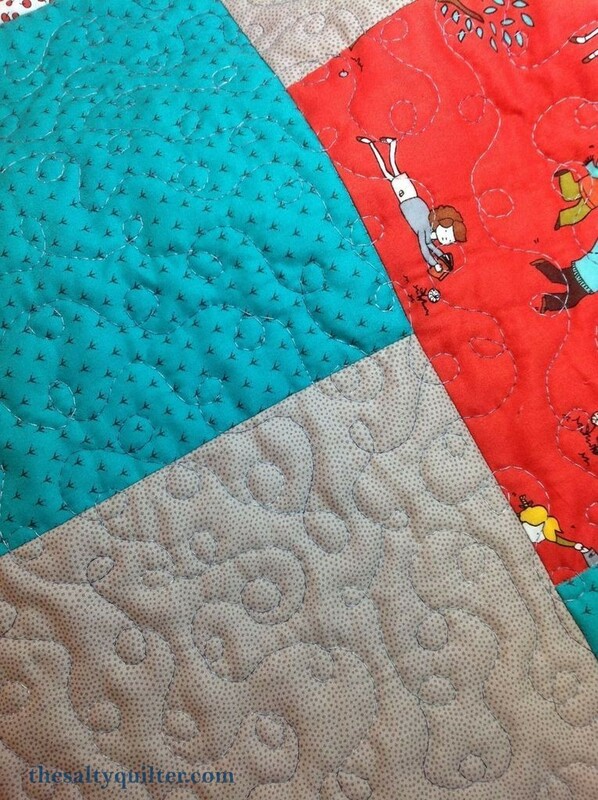 Ditch quilted with YLI invisible thread and 50wt Gutterman cotton in the bobbin. FMQ in all over loop de loop in grey variegated 30wt Gutterman cotton.